Chemical Constituents and Components : Main chemical constituents are ephedrine, pseudoephedrine, phytosterol, potassium nitrate and alkaloids. Alkaloids: 1. It acts directly thermogenesis in the human body and helpful to reduce weight. 2. It causes vasodilation of arteries. 3. It shows potent free radical scavenging activity. 4. It arrests the cell cycle in human osteosarcoma cell line. Curing Diseases : 1. It act as bronchodilator and useful in asthma. 2. It is useful in cystitis, bleeding piles and chronic dysentery. 3. 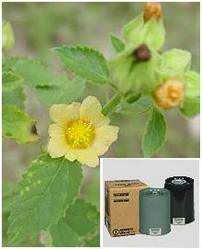 It is useful in nervine disorders like monoplegia, sciatica and palsy. 4. It is diuretic, diaphoretic, astringent and anti-asthmatic. 5. It is used in case of spermatorrhoea, polyurea and leucorrhea. Possible Combinations : Sida cordifolia + aegle marmelos + mimosa pudica (antibacterial).